Peterson Real Fyre Charred Series Gas Logs reflect the glowing depth and fiery heart of a long burning fire. Real Fyre artisans work from actual wood samples to carefully recreate the intricate bark detail and natural coloration of deeply charred wood. 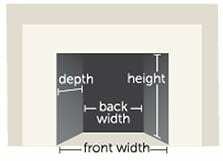 Gas fireplace logs are convenient and easy to use for most gas fireplaces. The beautiful display and flame presentation of this Real Fyre Charred Wood gas log set is ideal for creating those magic moments and memories. 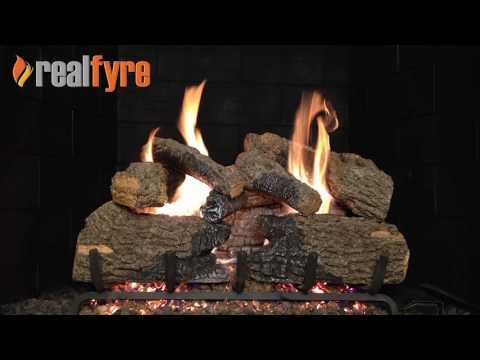 This Peterson Real Fyre gas log set includes: Ceramic Refractory Vented Gas Logs, Vented Glowing Ember Burner, Custom Grate, Connector Kit, Glowing Embers, Sand, Burner Clips, and Damper Clamp. The Peterson Real Fyre vented Natural Gas G4 Burner with its single burner pipe allows the flames to dance through the center of your log set and has a BTU output of 90,000 BTUs. This set features a manual safety pilot valve.